SCR95 ALLAIN FISH/FISHING - Requests the Coastal Protection and Restoration Authority and the Department of Wildlife and Fisheries to develop a proposal seeking Open Ocean TIG and RW TIG funds to monitor red snapper and other reef fish impacted by the Deepwater Horizon oil spill. SCR99 ALLAIN WATER/WATERWAYS - Establishes a task force to study and make recommendations on the issue of public access on the navigable waters of the state. 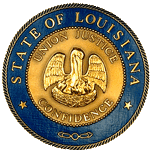 Consideration of approval of the sale of surplus property from the Louisiana Workforce Commission located at 121 Convention Street, Baton Rouge, LA. in East Baton Rouge Parish.